Once a fishing village turned artists’ colony, St Ives is home to a plethora of art galleries including the eminent Tate St Ives. 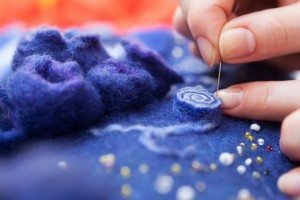 As well as witnessing world-class art and coming face-to-face with local artists, why not get in touch with your creative side trying these arty activities in St Ives? Enter the magical environment of Hepworth’s Sculpture Garden on a fun family activity trail that encourages you to draw while you explore (sketch book and art materials included). There is also a treasure hunt game and sculpture quest, to engage adventurous families on an interactive tour around the studio, museum and garden of one of St Ives’ most famous artists. Proof that art appreciation isn’t just for adults, you can get creative and have some fabulous holiday fun at Tate Create. Investigate materials, make art together and explore the exhibition. Each holiday we’ll be investigating a new theme, inspired by the fantastic artwork in the galleries. For families with children under 12. Free with admission, Local’s Pass or Tate Membership. Drop in, no booking required, but places will be limited at busy times. 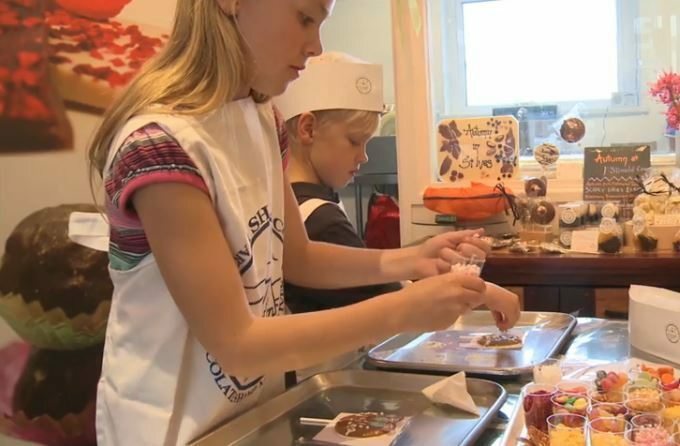 Kids can get stuck into their favourite food during a chocolate-making workshop at the Cornish chocolatier ‘I Should Coco’. Learn the skills of an artisan chocolate maker, create your own chocolate designs and decorations, and take your delicious chocolate goodies home to share with friends and family. Courses are held on various dates throughout school holidays. £15 per child. Design and create your own clay models at a hands-on, messy clay session at the Leach Pottery. Held on Tuesdays and Wednesdays during the holidays for kids aged 6-12, the one-hour workshops cost £6 per child (parents free). Get back to the basics of art with guided exercises in drawing, try a sketching and sculpting workshop, or create unique mosaics using beach treasure. There are all sorts of inspiring workshops and arty sessions held at the seafront Barnoon Workshop – you can even learn to make felt flowers, try knitting, cast resin charms and hand-make paper using recycled materials. Prices and times vary. Ever wanted to commit the wild coastal landscape of St Ives to canvas? Under the tutelage of artist Gary Long you can learn to capture the drama of where the land meets the sea, using water-based media to express the energy and movement of the sea. 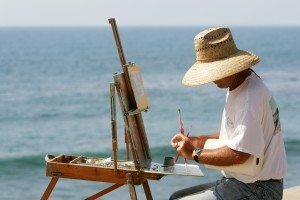 Other courses with the experts at the St Ives School of Painting include a ‘Stroll and Sketch’ around St Ives, landscape painting, an introduction to oils, and printmaking. A great way to explore the warren of cobbled streets, the Back Road Trail takes you to the best of the local art and crafts galleries – many of which are off the beaten tourist trail. Come face-to-face with local artists and witness a mix of modern and traditional arts, pottery and even a chocolate workshop. Maps and information are available from the Visit St Ives Information Centre. Delve into the arty vibe of St Ives from one of Carbis Bays Holidays’ stylish self-catering cottages. Hepworth and Pelagos which are both part of Barbara Hepworth’s former home. Porth Glas, Prospect, Whistler and Wallis are a few more luxury properties footsteps from the town’s galleries.